Societal responses and underlying vulnerabilities will largely determine how severe these impacts will be for any given population. 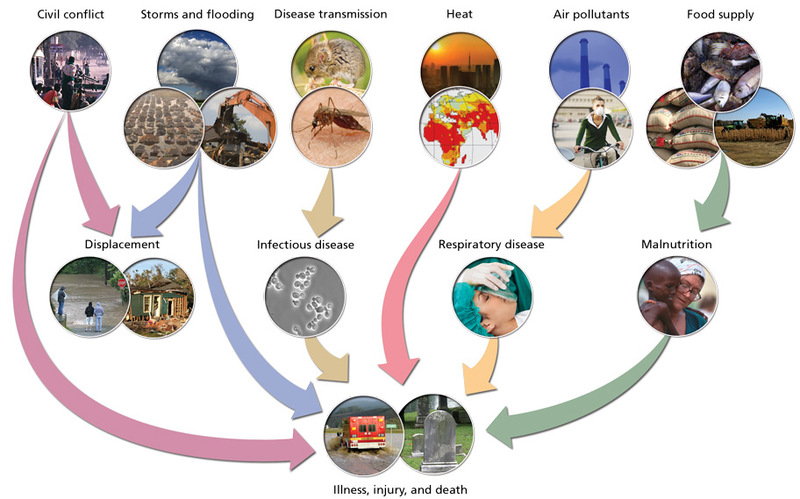 Public health resources that can help reduce climate-related health impacts are often very limited in developing nations. Even in industrialized nations, some populations, such as children, the elderly, and the poor, are most vulnerable to a range of climate-related health effects. Increased incidence of cardio-respiratory diseases caused by higher concentrations of ground-level ozone (smog) is projected. Ground-level ozone formation increases under the hot and stagnant conditions that are expected to increase in a warmer world. Breathing ozone results in short-term decreases in lung function and damages the cells lining the lungs. It increases the incidence of asthma-related hospital visits and premature deaths. Vulnerability to ozone effects is greater for those who spend time outside, especially with physical exertion, including children, outdoor workers, and athletes. Increased incidence of infectious diseases, such as those transmitted by insects and rodents, may become more common in regions where these diseases are not currently prevalent. Higher temperatures and changes in precipitation can alter the ranges and life cycles of disease-causing pathogens and the animals that carry them. For example, higher temperatures are associated with shorter egg-laying cycles, faster development, and increased survival among the mosquitoes that carry malaria. Impacts of climate change on food and water supplies are also expected to affect human health adversely, particularly in less developed countries. About one-sixth of the human population is already malnourished, and climate change will further challenge food production for the hungry. Hundreds of millions of people face water shortages that will worsen as temperatures rise. Regions most at risk include those already subject to drought.